"It looks like it's touching the clouds. . . Why did they make it so tall?. . . 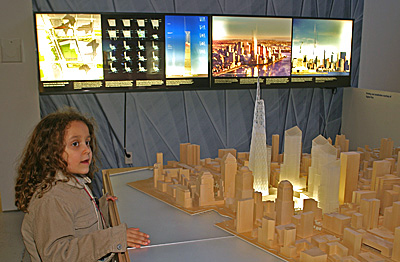 I think the airplanes are going to crash into the points, because it's the tallest part of the building." 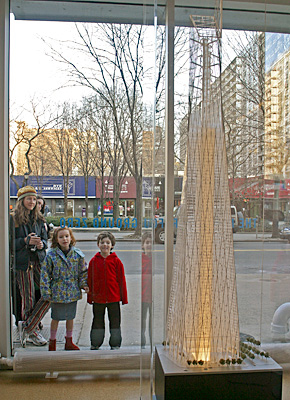 2/04  Adina, 6, on the terrace of her apartment only blocks from Ground Zero, where there is now a hole in the sky above her where the Twin Towers once stood. Max: ". . . it's very good for the economy, because so many people will be working in these five buildings. . . That will make our economy better, because there will be more jobs available for people." Sarah: "I think it's a really nice building, but it may just be making a new target for terrorist attacks, and I think that's bad. They might decide, 'Well, now that we blew up the Twin Towers, and they're building a new one, so we can blow that one up too. 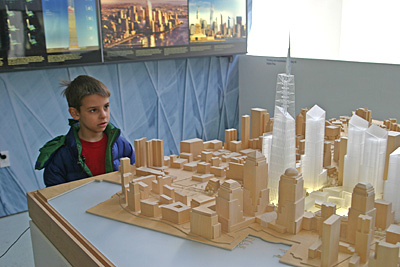 . .' I might want to remember the World Trade Center, and just call it the World Trade Center Reproduction. . . Maybe they could make also part of it as a place to represent, like, peace  and maybe it won't happen again  and they could call it the Trading Center of Peace." "It's weird that they made, like, another tall building, 'cause then it can fall again easily." 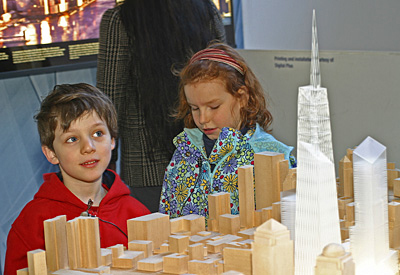 5/04  Loyan Beausoleil with Gale, 7, and Leo, 6, viewing the large model of the new World Trade Center at The Center for Architecture. Gale and Leo witnessed the first plane attack only three blocks from Ground Zero. Gale: "I don't like how tall it is, because an airplane can't knock a little building down."